After a difficult race in Aragón, Spain, where late rain caused havoc in the dying laps and for the first time in 36 races (Misano 2012) a Repsol Honda rider failed to take a podium finish, Marc Marquez and Dani Pedrosa are en route to Japan for the first of the three fly-away races. Located amongst the vast natural beauty of the northern Kanto district, the twin ring circuit at Motegi in Japan consists of a 1.5 mile oval and a 2.9 mile road course constructed to international standards. Built by Honda as the ultimate test facility in August 1997, the road circuit became home to MotoGP in 2000. Marc won here in 2012 (Moto2) and 2010 (125cc) and finished 2nd in 2013 (MotoGP) and 2011 (Moto2). Dani has enjoyed three victories – 2012, 2011 (MotoGP) and 2004 (250cc), one 2nd place finish in 2005 (250cc) and three 3rd positions in 2013, 2009 and 2008 (MotoGP). This weekend will serve as the first chance for reigning World Champion, Marc, to retain his crown. 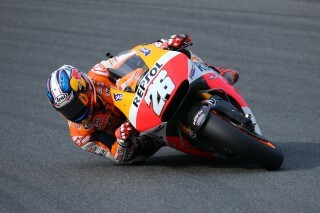 With a margin of 75 points over second place Dani, a win in Motegi would seal the Championship. A finish other than 1st would then rely on the final placement of his competitors.